During 2012 – 2016 volunteers from the Abergavenny and District Civic Society studied the streets, spaces and buildings of Abergavenny and Mardy outside the town centre (already the subject of a County Council appraisal). 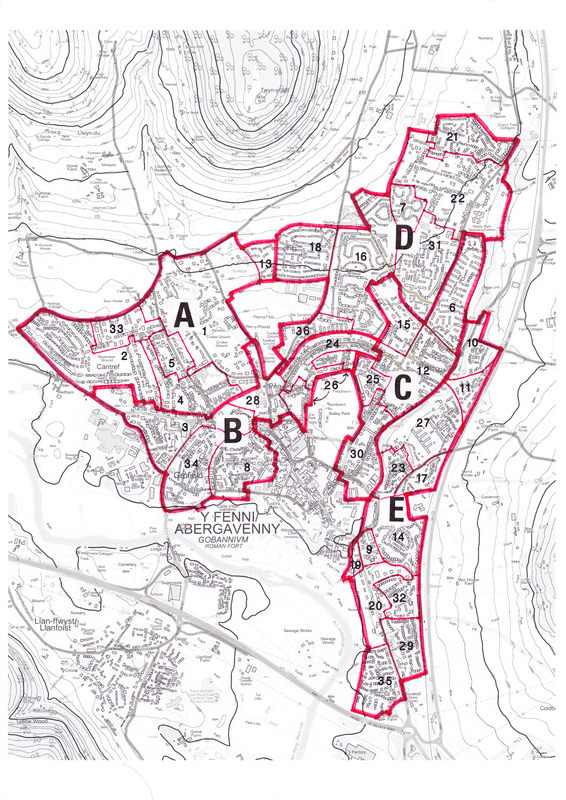 The process is known as ‘characterisa­tion’, defined by the Welsh Government as ‘capturing the local distinctiveness by identifying how places have been shaped over time’, and the study started as a pilot project with the Civic Trust for Wales. This unique record of what makes each part of our town distinctive, and often rather special, increases our awareness of the qualities that need to be considered and respected when new development is proposed. We hope that the planning authority will take note of our survey and take account of our views. The following pages are the outcome of the study. We would welcome further contributions from residents of the town or anyone else with an interest in its past and future. Have we made any mistakes? Can you add to the history of the area? Do you agree with our impressions of the area? What have we missed that should have been recorded? A printed copy of Exploring Abergavenny can be viewed at Abergavenny Library. Comments may be sent to abercivsoc@gmail.com.